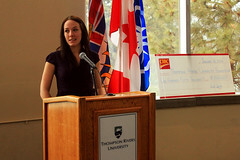 Alex Condon, a fourth-year student majoring in Economics and minoring in Philosophy was one of 1,088 students to receive a scholarship or bursary through the Foundation in 2011. Condon also played on the WolfPack baseball team and for two consecutive years received the Alvin and Lydia Grunert Scholarship which is awarded annually to the top domestic undergraduate student in each TRU faculty and school. Upon receiving the letter informing me that I would be receiving this grant, a huge weight was lifted off my shoulders. Not 2 minutes earlier I had been embarrassingly sifting through my friends to see who was willing to help me pay that months rent. This grant not only allowed me to keep the roof over my head, it also pushed me out of a financial ditch that seemed to be growing exponentially. Hopefully I do not sound dramatic when I say I am extremely grateful to have received this grant from TRU. If possible, we need to encourage our board, and any other bureaucratic elements within the school that grants, and bursaries such as the one I received need to be more prevalent at TRU. This may seem like small amount of money to some, but to a struggling student this money will go a long way, not only in their financials, but also in their general attitude towards school. Knowing your university will do what it can to help its students out is a great feeling. I hope more students are able to experience this. I was one of the recipients of your award to adventure students this year, and I wish to sincerely thank you for this award. I was amazed when Sharman told me that my faculty had recommended me for such an honor. When he told me the news, he asked me what I planned for myself after the program and I part ways. I told him I wish to travel and follow the summer season so I could work as a class 4 raft guide soon and travel globally with this, for this was the main reason I had chosen to apply to the program in the first place. Rafting and kayaking have become my biggest passions in life and hopefully a future business endeavor. In my travels, I hope to gain a true grasp on many different cultures as I settle in different countries for a long enough time to say I truly live there. My interest in meeting new people along with my love of being in and on the water are what have always kept me going in a life focused on following my passion, rather that settling onto the path most chosen. When I do return to British Columbia, I hope to return to TRU as an assistant instructor to work with the program that taught me. Sharman and the many other whitewater instructors, each one unique and helpful, have taught me a lot of important lessons, as well as the rest of the program and its incredible opportunities. Thank you so much. I cannot express fully my thanks in just one letter. Receiving an award was a much appreciated reminder of the support TRU students have from alumni and friends. Having the opportunity to meet, and have dinner with my donor himself made for an even more memorable occasion and I was grateful for the opportunity to personally thank him, on behalf of the Adventure Studies department for his continued support of students. When I won the Tourism Scholarship, I felt very appreciated and acknowledged. Winning this award was such a memorable moment because I had been recognized for my hard work and dedication to my studies. I was immediately motivated to continue working hard and become more involved in my studies, as well as volunteer work. I want to pay the kindness forward, hoping every person can feel as wonderful as I did.